Download "Cllr Ray Theodoulou. 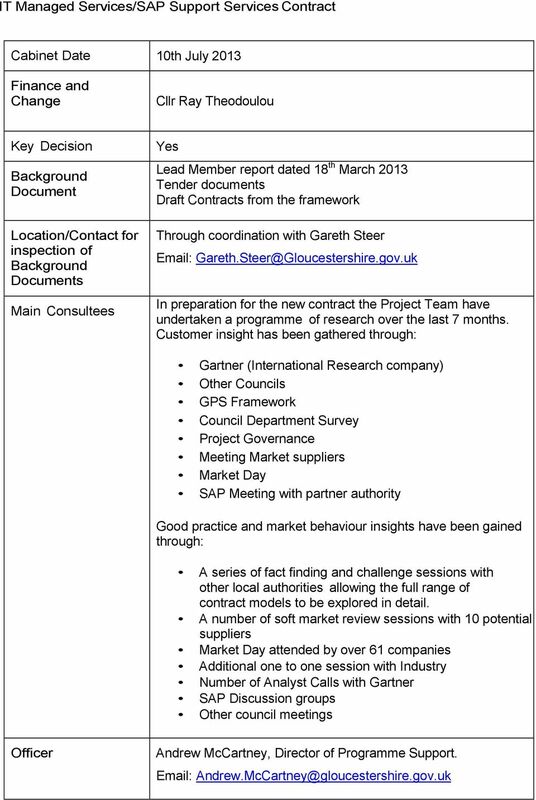 Yes Lead Member report dated 18 th March 2013 Tender documents Draft Contracts from the framework"
1 IT Managed Services/SAP Support Services Contract Cabinet Date 10th July 2013 Finance and Change Cllr Ray Theodoulou Key Decision Background Document Location/Contact for inspection of Background Documents Main Consultees Yes Lead Member report dated 18 th March 2013 Tender documents Draft Contracts from the framework Through coordination with Gareth Steer In preparation for the new contract the Project Team have undertaken a programme of research over the last 7 months. Customer insight has been gathered through: Gartner (International Research company) Other Councils GPS Framework Council Department Survey Project Governance Meeting Market suppliers Market Day SAP Meeting with partner authority Good practice and market behaviour insights have been gained through: A series of fact finding and challenge sessions with other local authorities allowing the full range of contract models to be explored in detail. A number of soft market review sessions with 10 potential suppliers Market Day attended by over 61 companies Additional one to one session with Industry Number of Analyst Calls with Gartner SAP Discussion groups Other council meetings Officer Andrew McCartney, Director of Programme Support. 2 Key Dates Activity Date Cabinet Approval 10 July 2013 Start Tendering process 19 July 2013 Deadline for Receipt of tenders 27 September 2013 (5pm) Award 25 October 2013 Start of Transition 11 November 2013 Go Live date 01 April 2014 Purpose of Report To inform Cabinet of the key provisions of the Invitation to Tender (ITT), evaluation methodology, payment and performance measures and the contract terms and to seek authority to proceed to issue the ITT and award the contracts for the ICT Managed Service Procurement and the SAP Support Services. 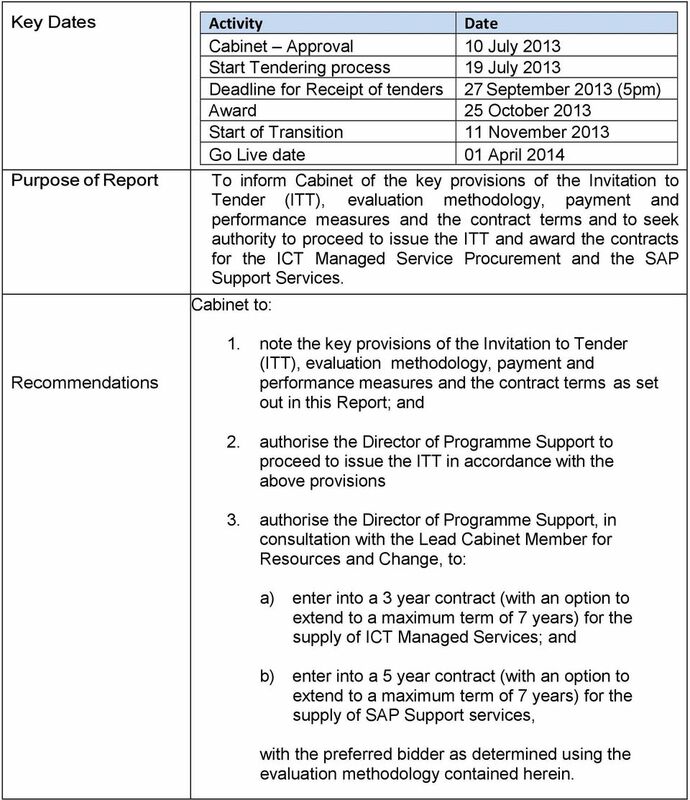 Cabinet to: Recommendations 1. note the key provisions of the Invitation to Tender (ITT), evaluation methodology, payment and performance measures and the contract terms as set out in this Report; and 2. authorise the Director of Programme Support to proceed to issue the ITT in accordance with the above provisions 3. authorise the Director of Programme Support, in consultation with the Lead Cabinet Member for Resources and Change, to: a) enter into a 3 year contract (with an option to extend to a maximum term of 7 years) for the supply of ICT Managed Services; and b) enter into a 5 year contract (with an option to extend to a maximum term of 7 years) for the supply of SAP Support services, with the preferred bidder as determined using the evaluation methodology contained herein. 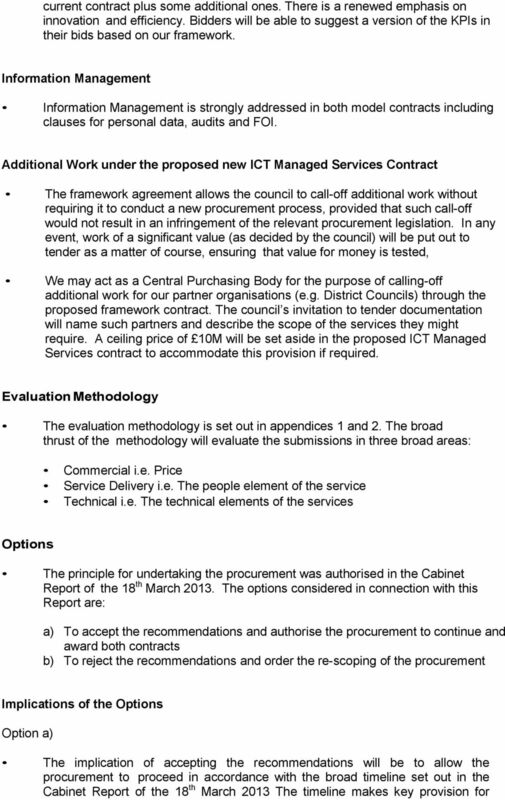 3 Reasons for Recommendations The current contract with Capita SIS expires on March As there is no ability to extend the current contract, a new one needs to be commissioned. The current SAP Support Service with Capgemini also expires on March The recommendation provides Cabinet with the opportunity to confirm its support for the Director of Programme Support to conclude the procurement process. 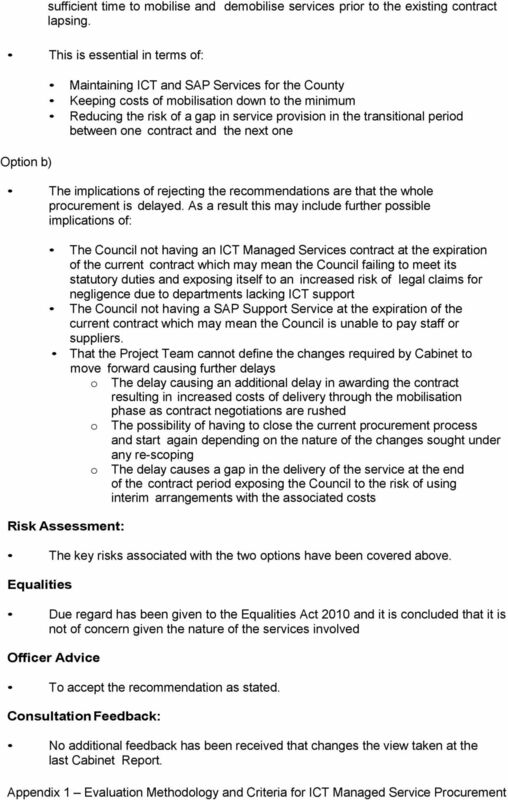 To enable the council to keep its ICT and SAP Services running for the purpose of meeting its statutory duties; paying staff wages; and paying supplier debts as they fall due (thereby reducing the council s exposure to risk of legal claims arising therefrom). 4 Resource Implications The annual budget for ICT is currently 6.5m. Although 3m of this relates to various software, network and telephony costs which are controlled by the Client side. 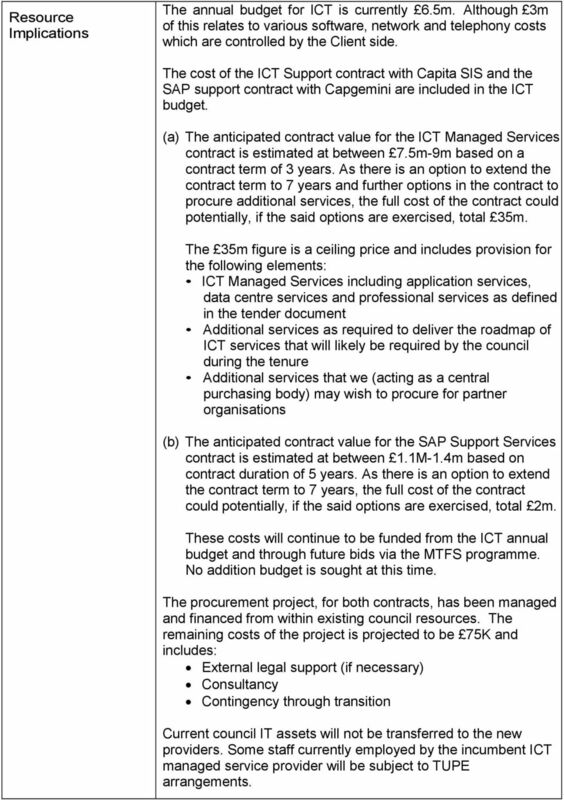 The cost of the ICT Support contract with Capita SIS and the SAP support contract with Capgemini are included in the ICT budget. (a) The anticipated contract value for the ICT Managed Services contract is estimated at between 7.5m-9m based on a contract term of 3 years. As there is an option to extend the contract term to 7 years and further options in the contract to procure additional services, the full cost of the contract could potentially, if the said options are exercised, total 35m. 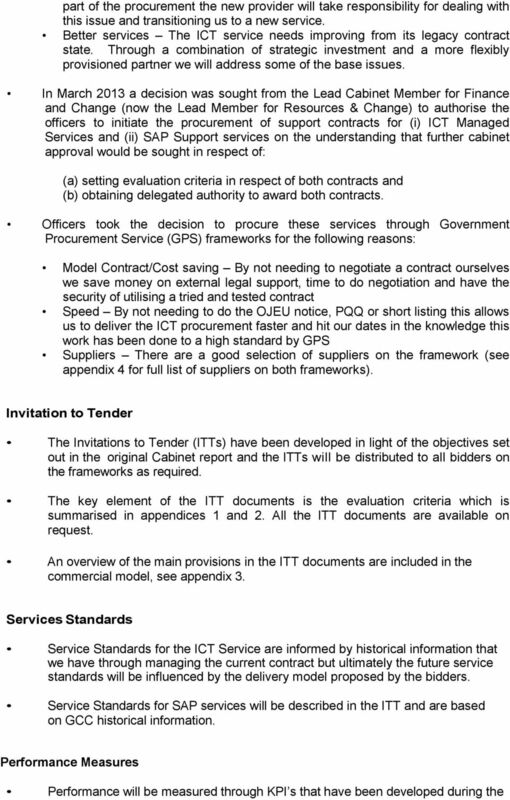 The 35m figure is a ceiling price and includes provision for the following elements: ICT Managed Services including application services, data centre services and professional services as defined in the tender document Additional services as required to deliver the roadmap of ICT services that will likely be required by the council during the tenure Additional services that we (acting as a central purchasing body) may wish to procure for partner organisations (b) The anticipated contract value for the SAP Support Services contract is estimated at between 1.1M-1.4m based on contract duration of 5 years. As there is an option to extend the contract term to 7 years, the full cost of the contract could potentially, if the said options are exercised, total 2m. These costs will continue to be funded from the ICT annual budget and through future bids via the MTFS programme. No addition budget is sought at this time. The procurement project, for both contracts, has been managed and financed from within existing council resources. The remaining costs of the project is projected to be 75K and includes: External legal support (if necessary) Consultancy Contingency through transition Current council IT assets will not be transferred to the new providers. Some staff currently employed by the incumbent ICT managed service provider will be subject to TUPE arrangements. (2) That the contract runs from 1 April 2015 for an initial period of seven years. The value of the contract will be in the order of 10m per annum. 1.1. The Chair welcomed Board members and colleagues to the 3rd SSRO Board meeting. 04/08 DECISION UNDER DELEGATED POWERS DECISION CANNOT BE TAKEN BEFORE 23 JANUARY 2008 Title REPLACEMENT OF FINANCIAL SYSTEMS Report to the Cabinet Member for Residents and Resources. Purpose Outcomes 1. 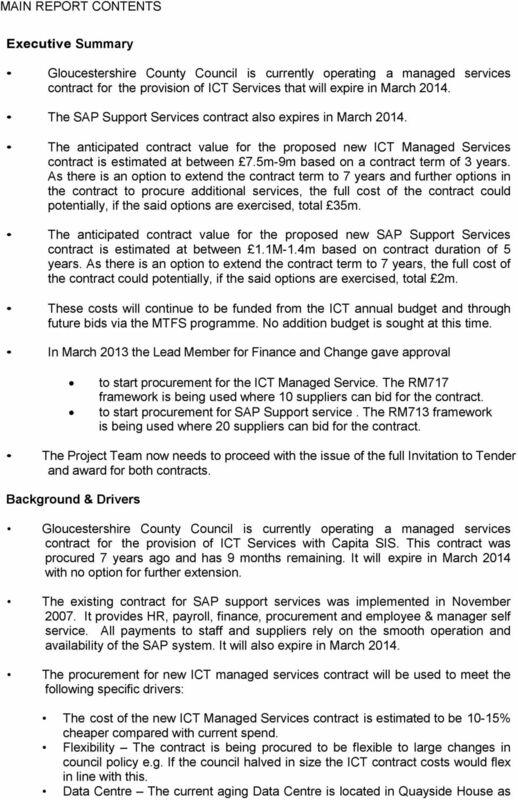 SUFFOLK COUNTY COUNCIL PROCUREMENT RULES 2015 Version 2 Jan 2016. Page 1 of 19 TABLE OF CONTENTS 1. Introduction and Definitions... 3 2. Scope... 4 3. General Principles... 5 4. Responsibilities... 7 5. DECISION BOOK. The decision book is open to public inspection at the Civic Offices between 9.00 am and 5.00 pm, Mondays to Fridays. 1. The transfer of the service vehicle fleet and pool car fleet management to the County Council from 1 July 2013. MINUTES OF THE AUDIT MEETING HELD ON 27 JULY 2016 AT KENNET COMMITTEE ROOM. Date 15.6.09. Date 17.6.09. Date 18.06.09. Date Name of TU rep. N/A Date. Date 19.06.09. Date 19.06.09. Date 19.06.09. Date 19.06.09. Date 4.09. Recommendations which have been implemented have been removed from this report. The original numbering of recommendations has been retained.